Anula Edirisinche (center) inside her tiny restaurant, Anula's Cafe. 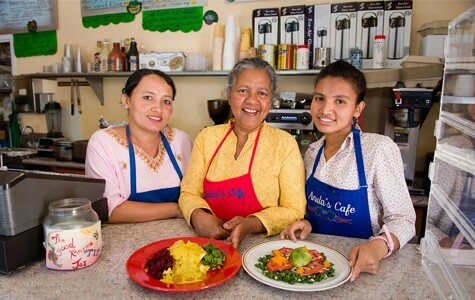 By far the best and most popular dish at Anula’s Cafe (1319 Franklin St.), a tiny deli-cafe in downtown Oakland, is its Tuesday jerk chicken special, a recipe that Anula Edirisinche, the restaurant’s Sri Lankan owner, learned years ago from her Jamaican mother-in-law. For the past week, however, the restaurant hasn’t been able to serve the jerk chicken, or its Caribbean-style chicken rotis or curry-tinged tilapia fillets either, for that matter. In fact, last Tuesday, an Alameda County health inspector ruled that Anula’s could no longer serve any meat dishes — only vegetarian fare. According to Edirisinche, the ruling threatens the continued existence of her business. She doesn’t believe she can stay in business if she only sells vegetarian dishes. But she also can’t afford to pay an additional $25 to $35 an hour — on top of what she already pays for rent — to do all of her cooking at a commercial kitchen space for two or three hours every day. And because she still has four years left on her lease, moving to a new location altogether isn’t an option. The online record of last week’s inspection makes no specific mention of meat, however — there, the main violations have to do with food safety certification and holding “potentially hazardous foods” at a proper temperature — below 45 degrees or above 135 degrees Fahrenheit. At first, Edirisinche thought she could correct that problem by buying Sterno burners to keep the food hot in warming trays, buffet-style, but she was later told that still wouldn’t be okay. Anyone who has ever ordered food at Anula’s is certainly aware of the tight quarters. The kitchen has a small stovetop, and there are often big pots of assorted soups and stews cooking on all four burners. Indeed, Edirisinche admitted that in previous years inspectors had also told her that she really shouldn’t be cooking in that space. But in the end they’d always left her alone. I reached out to the Alameda County Environmental Health Agency, but, as of this posting, no one from that office has responded to my request for comment.